Pope Adrian VI (March 2, 1459 - September 14, 1523), born Adriaan Florenszoon Boeyens, served as Bishop of Rome from January 9, 1522, until his death some eighteen months later. The only Dutchman to become pope, he was the last non-Italian pope until John Paul II, 456 years later. Born in Utrecht, he studied at the University of Louvain in France, where he rose to the position of professor of theology, then rector and vice-chancellor. In 1507, he became the tutor of the future Holy Roman Emperor Charles V, who later trusted him as both his emissary and his regent. 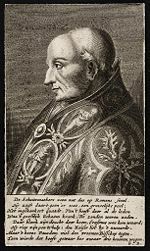 In 1516, Adrian became bishop of Tortosa, Spain, and was soon appointed grand inquisitor of the kingdoms of Aragon and Castile. He was appointed cardinal by Pope Leo X in 1517 and elected pope in 1522 as a compromise candidate after Leo's death. Adrian came to the papacy in the midst of one of its greatest crises, threatened not only by Lutheranism to the north but also by the advance of the Ottoman Turks to the east. He refused to compromise with Lutheranism theologically, demanding Luther's condemnation as a heretic. However, he is noted for having attempted to reform the Catholic Church administratively in response to the Protestant Reformation. His efforts at reform, however, proved fruitless, as they were resisted by most of his Renaissance ecclesiastical contemporaries, and he did not live long enough to see his efforts through to their conclusion. He was succeeded by the Italian Medici pope, Clement VII. Adrian IV was born Adriaan Florenszoon Boeyens under modest circumstances in the city of Utrecht, which was then the capital of the bishopric of Utrecht, the Netherlands. The city was at that time part of the Holy Roman Empire, which was largely populated by Germans, and for this reason Adrian is sometimes regarded as a German pope, although he was clearly a Dutchman. His father was Florens Boeyens van Utrecht, and his mother's name was Gertruid. His father, a carpenter and likely shipwright, died when Adrian was 10 years old or younger. 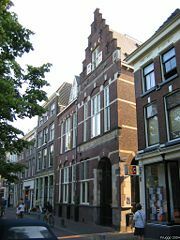 Adrian studied from a very young age under the Brethren of the Common Life, either at Zwolle or Deventer. He was also a student of the Latin school in Zwolle. In June 1476, he started his studies at the University of Louvain, France, where he pursued philosophy, theology, and canon law, supported by a scholarship granted by Margaret, Duchess of Burgundy. He earned a doctorate in theology in 1491, became dean of St. Peter's church in Louvain, and later vice-chancellor of the university. His lectures were recreated and published from the notes of his students, one of whom was the young Erasmus of Rotterdam. In 1507, Adrian entered the world of imperial politics when he was appointed tutor to Emperor Maximilian I's (1493-1519) seven year old grandson, Charles, who was later to become Emperor Charles V (1519-56). In 1515, Adrian was sent to Spain on a diplomatic errand. Soon after his arrival at the imperial court in Toledo, he became bishop of Tortosa. In 1516, he was commissioned as inquisitor general of the kingdom of Aragon. The following year, Pope Leo X (1513-21) created Adrian a cardinal. During the minority of Charles V, Adrian was named to serve with Francisco Cardinal Jimenez de Cisneros as co-regent of Spain. After the death of Jimenez, Adrian was appointed (March 14, 1518) general of the unified inquisitions of Castile and Aragon, in which capacity he acted until his departure for Rome. After being elected emperor in 1519, Charles V left for the Netherlands in 1520 and appointed the future pope regent of Spain. During this time he had to deal with the Revolt of the Comuneros, which lasted nearly a year, until the Battle of Villalar on April 23, 1521, after which the rebel leaders were beheaded. Adrian VI by Hendrik Bary. After the death of Pope Leo X, his cousin, Cardinal Giulio de' Medici was the leading candidate to succeed him. However, with Spanish and French cardinals in a deadlock, the absent Adrian was proposed as a compromise candidate. He was thus elected pope on January 9, 1522, by a nearly unanimous vote. Charles V was delighted to hear that his old tutor had been elected to the papacy, but soon realized that Adrian VI was determined to reign impartially. Meanwhile, Francis I of France, who feared that Adrian would become a tool of the emperor, threatened a schism but soon relented and sent an embassy to present his homage. Adrian left Spain for Italy at the earliest opportunity, making his solemn entry into Rome on August 29, 1522. He was installed in St. Peter's Basilica on August 31, at the age of 63. After arriving in Rome, Adrian immediately instituted reforms within a very resistant papal court. He also had to contend with the Lutheran revolt in Germany, while at the same time dealing with the threat of the Turks, who already controlled Belgrade and now threatened Hungary. Adrian's plan was to attack the most notorious abuses one by one, beginning with the practice of selling indulgences. In this attempt, however, he was hampered by his cardinals, who badly needed the money gained from this lucrative enterprise. The extravagant Pope Leo X, meanwhile, had left the papal finances in trouble, and Adrian thus found it impossible to reduce the number of dispensations given to divorce and remarry. The Italian nobility, meanwhile, viewed Adrian as a pedantic foreign professor and who was blind to the beauty of classical antiquity. Musicians such as the noted French composer and sacred singer Carpentras, who was master of the papal chapel under Leo X, left Rome due to Adrian VI's apparent indifference to the arts. Epithets such as miser and even barbarian were applied to Adrian as a result. In his reaction to the early stages of the Lutheran revolt, Adrian apparently did not fully comprehend the gravity of the situation. At the Diet of Nuremberg, which opened in December 1522, he instructed his emissary, Francesco Chiericati, that the Roman Church was indeed in need of reform on administrative issues like indulgences and the corruption of the clergy. However, as a former head of the Inquisition, he refused any compromise on doctrinal issues, and demanded that Luther be punished for teaching heresy. Meanwhile, in 1522, Sultan Suleiman I (1520-66) had conquered Rhodes, giving the Ottomans strategic dominance in the eastern Mediterranean. Adrian did not succeed as a peacemaker among Christian princes, whom he hoped to unite in a war against the Turks. In August 1523, he was forced into an alliance with the Empire, England, and Venice against France. Adrian VI died on September 14, 1523, after a somewhat brief tenure. He is buried in the German national church in Rome, Santa Maria dell'Anima. Adrian was succeeded by Clement VII, one of the Medici popes under whom Adrian's attempts at reform would not be continued, and the Protestant Reformation would win new territories and many new adherents in northern Europe. Adrian would be the last non-Italian to serve as pope until John Paul II in the late twentieth century. Most of Adrian's official papers were lost after his death. However, the statement in one of his works that a pope may err—both privately or even in a decree on matters of faith—attracted much attention from reformers. Catholics claim that this statement was a private opinion of the pope, not an official pronouncement and therefore does not conflict with the dogma of papal infallibility. Adrian plays a minor role in The Tragical History of Doctor Faustus, a famous play by Christopher Marlowe. Italian writer Luigi Malerba used the confusion among the leaders of the Catholic Church, which was created by Adrian's unexpected election, as backdrop for his 1995 novel, Le maschere (The Masks), about the struggle between two Roman cardinals for a well-endowed church office. Gross, Ernie. This Day In Religion. New York: Neal-Schuman Publishers, Inc, 1990. ISBN 1555700454. Malerba Luigi. Le maschere. Milan: A. Mondadori, 1995. ISBN 8804393661. Noel, Gerard. The Renaissance Popes: Statesmen, Warriors, and the Great Borgia Myth. New York: Carrol & Graf Publishers, 2006. ISBN 9780786718412. Olin, John C. The Catholic Reformation: Savonarola to Ignatius Loyola; Reform in the Church 1495-1540. New York: Fordham University Press. ISBN 9780823214785. 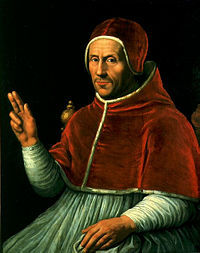 History of "Pope Adrian VI"
This page was last modified on 31 March 2019, at 22:39.